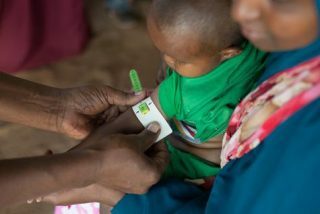 A child is screened for malnutrition in Somalia. On June 10, join Christians around the world and pray for those suffering from severe hunger and famine. On Sunday, June 10—the Global Day of Prayer to End Famine—people of faith across the globe will be praying for the millions of people around the world who are at risk of famine right now, or are already experiencing severe hunger. Millions of people living in Somalia, South Sudan, Yemen and Nigeria remain on the brink of famine. While concerted efforts last year meant that famine was averted, the potential is still high for many. Additionally, the majority of hungry and malnourished people—489 million—live in areas of the world affected by conflict. As rates of displacement and conflict remain high, prayerful support is one part of the ongoing response. Prayers and words for worship are available from Canadian Foodgrains Bank. More information on PWS&D’s emergency relief responses can be found here. To support the ongoing efforts, click here.